The perfect choice for home athletes looking for a versatile machine that can fit in a small space (6'x6'), the Vectra 1450 can be pushed against a wall or in a corner and still be fully functional. 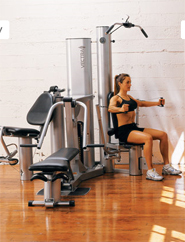 Vectra's 1650 Home Gym machine steps it up with two different training disciplines in one machine: fixed weight and free-weight training. 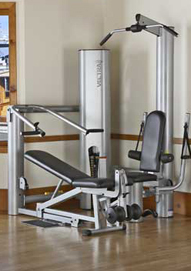 A versatile piece of home gym equipment by Vectra, the VX-11 can be used on its own for leg presses, calf presses, preacher curls and tricep extensions, or combined with the VX-18 or VX-38 as one component in the Series VX. 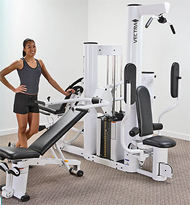 Designed to combine the best features of their VX-18 and VX-11 machines, Vectra's VX-28 is a versatile 2-stack gym that gives a full range of upper and lower body exercises. Building on the same design and engineering that won their VX-18 awards, Vectra designed the VX-38 to be a multiple weight-stack machine to support multiple users simultaneously. 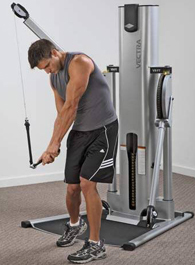 Vectra calls this trainer "The Ultimate Single Stack Functional Trainer," for good reason. 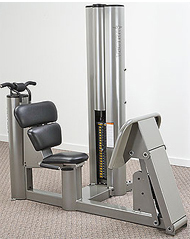 Compared to other trainers in its category, the VX-FT 1 Stack has twice as many pulley locations but requires half as many adjustments to use. 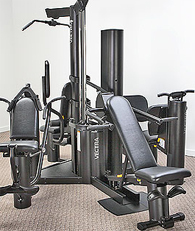 Vectra's VX-FT 2 Stack Trainer is a crossover machine great for both home and commercial gym use, providing great cross-training for the serious gym enthusiast. 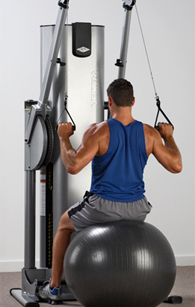 Vectra's VX-DC is a modular assisted dip/chin machine perfect for home use or as a component in a commercial gym.